Results: Endorsement by President Juan Manuel Santos; consultation on the Colombian government’s peace process toward the signing of the FARC Peace Treaty; Activating National Youth Leadership & Entrepreneurship: A Transmedia Strategy (iNNpulsa); Heroes Festival promoting education, innovation, science & technology, and entrepreneurialism; full transmedia implementation across Colombian media. Description: The primary focus of our work was in activating youth toward careers in entrepreneurism, community leadership, and business innovation leadership across the country, including rural areas. To diagnose why young Colombians were hesitant to realize their potential in business and politics, instead behaving listlessly and remaining “under the radar,” Starlight Runner needed to understand what factors contributed to a kind of generational “malaise,” despite the fact that education and technology had vastly improved in Colombia in recent years. Starlight Runner and Out of the Blu were asked the Colombian government to furnish huge amounts of demographic data for analysis, and the team tracked perceptions about success, finance, tenacity and ambition in Colombian popular culture over the course of the past several decades. Most importantly, the team gathered thousands of “micro-narratives” brief interviews about key issues around this topic from a cross-section of Colombian youth, their parents and grandparents, as well as an array of different types of authority figures. These brief personal accounts yielded the most compelling evidence for why young Colombians were not applying themselves. The answer lay in what Starlight Runner calls intergenerational trauma. While the violent clashes of the Colombian civil war had ended at the turn of the century, the parents of today’s college-aged and post-college young adults had been directly affected by them. For decades, if you were in any way successful in Colombia, the chances of your being drawn into the terrible conflict on one side or the other were much greater. Parents, teachers, law enforcement, the clergy, even popular Colombian television shows and movies either explicitly or implicitly stated that to be a successful business or political leader was dangerous to your health—or to the health of your loved ones. This “keep your head low” syndrome was passed down from parent to child as a means of protection and self-defense. Starlight Runner concluded that any treatment of this syndrome would entail compelling storytelling across all of Colombian media, which asserted the fact that the time to hide is over, the civil war had ended, and that there were now any number of potent opportunities for young people there. The stumbling blocks to this prescription were formidable: 1) Highly influential leaders from business, government, and the clergy would be needed to tell their stories and reinforce the notion that success, wealth, and community participation were now good things in Colombia. And an array of media influencers would be needed to form a community of interest to push those stories (and fictional ones like it) across multiple media platforms. And perhaps more importantly, 2) The team learned that people were not entirely convinced that the violence had ended once and for all. If there was a constant threat that the conflict would return to violence, then the stories being told would never be believed. There needed to be proof of a lasting peace between the Colombian government and the FARC guerillas, who still lived in rural areas of the country. A treaty needed to be signed. Both stumbling blocks were addressed at Heroes Fest, a conference promoting entrepreneurialism for young people held in Medellin, July 2014. At the conference, Starlight Runner CEO Jeff Gomez delivered a keynote that revealed the team’s findings about why young people were hesitant to apply themselves, and called for formalizing peace in Colombia. He also met with President Juan Manuel Santos to discuss intergenerational trauma, and how modifications to the administration’s narrative approach to peacebuilding could build momentum toward a treaty. Momentum built by the conference led to the formation of a community of interest among media executives, politicians, entrepreneurs, and clergy, allowing for government organization iNNpulsa to organize a transmedia advocacy campaign around the bold and exciting life path of the community leader and innovative entrepreneur. The campaign included efforts on the part of content developers at television, radio, and print content companies to integrate more compelling narratives depicting ambitious young Colombians. President Santos has also worked hard to rid himself of some of the aggressive and hyper-masculine rhetoric that continually inflamed the FARC, interfering with the peace process. 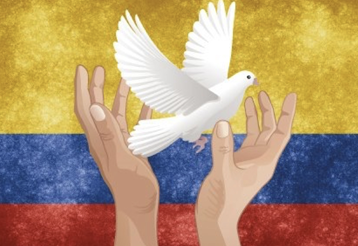 The treaty was finally signed in 2016, officially ending the Colombian civil conflict. With the signing of the treaty, Starlight Runner’s work was concluded. Challenges still to be faced by Colombian young adults now include an influx of people from “El Campo” (the rural and jungle covered areas of Colombia), some of whom were affiliated with the FARC, and may have been involved with causing harm to family members of urban citizens. There are many thousands who are hostile toward the idea of integrating people who for half a century had been declared sworn enemies. Programs for reconciliation and assimilation of these people are still in formation, and can have an impact on the behavior of educated young adults in urban areas. But what story do you have to tell to allow for a people once declared your sworn enemy to be integrated back into society? Starlight Runner has conveyed to the Colombian government that it is absolutely critical all involved, including former members of the now disbanded FARC, join in creating programs and multi-platform narratives that will give voice to these concerns, even as they suture and begin to heal the deepest of wounds.